Enjoy country hospitality within the ancient Cradle of Humankind world heritage site, close to Johannesburg, Sterkfontein Caves & Hartbeespoort Dam. This nineteen hectare lodge offers an idyllic and safe retreat with. 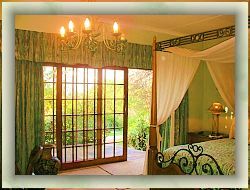 self-catering and B&B accommodation in seven luxury suites, all with their own private entrances. Our Wellness Centre offers steam room, treatment rooms and an indoor jacuzzi. while watching the Plasma screen TV, all included in the price of the suite. Completely unwind and indulge in our range of therapeutic treatments. DSTV is supplied to all our suites, as well as luxury linen, towels & soap. The suites are serviced daily. Bed & Breakfast suites have bar fridges and complimentary tea & coffee. Laundry service, babysitting, Internet and computer facilities are available. Enjoy a delicious country breakfast on the patio. Picnic braai-packs with a variety of meats & chicken are available and come with a scrumptious herb & garlic bread and seasonal salad. Check in time is between 14h00 and 20h00 and check out time is 11h00. Single night bookings for a Friday or Saturday are only available in certain suites, and a 35% surcharge is applicable. Single rates are available on request. horse riding, sunset dam cruises, quad bike trails, strawberry picking, Harrop's Balloon Safaris, Van Gaalen Cheese Farm, Snake Park, De Wildt Cheetah Centre and much more. 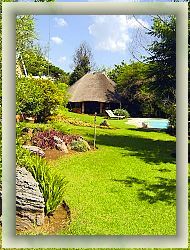 all local attractions as well as Johannesburg tours. Create your own party & enjoy in total privacy until DAWN!! !